Reading is an excellent way to spend some free time - it can open up new worlds and teach new information, and books have even been shown to increase empathy in people who read. However, for many people, staying focused on the book when there are so many distractions nearby can be incredibly difficult. 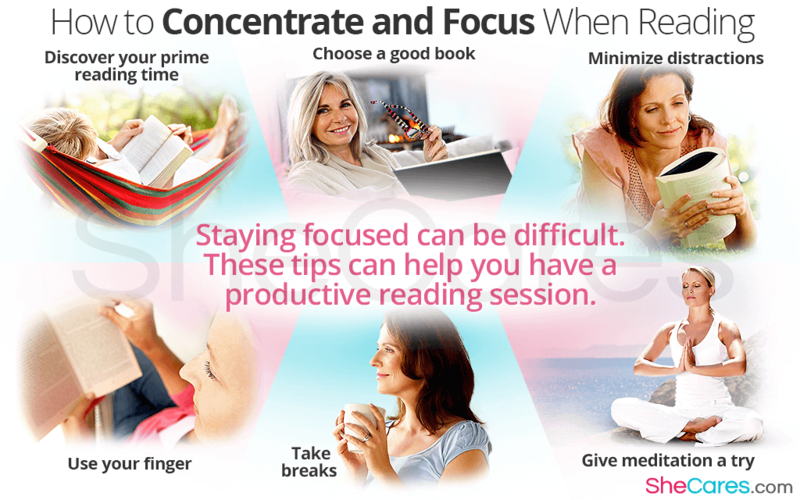 If you can't find it hard to focus while reading books,find out the best ways to remedy the situation and figure out how to concentrate while reading. One of the most important factors in the ability to focus on reading is finding something worth reading about. Many people who think they can't focus when reading are simply reading the wrong type of book. Being interested is the most important criterion. If you have something that you need to read that bores you, try training your brain to focus on a more interesting work of literature first, and then return to the other book later, when you've mastered how to concentrate when reading. Although it may seem juvenile, using your finger to follow the words as you read them can help keep your attention pinpointed on the text. This is especially helpful if you find your attention tends to wander forward in the text impatiently, trying to find out what happens next. It adds a physical reminder of where you are and what you should be focusing on. It can be hard to keep focused with the TV on, or around a group of lively friends. Remove yourself from the things that might distract you in order to be able to focus on your book. Your phone is also likely to be a distraction, so think about leaving it in a different room, or setting it to silent and only checking it every once in a while. If you're sitting in a hard or uncomfortable spot, any pain or discomfort you feel might be distracting you from the words you're trying to read. If you're liable to fall asleep, reading in bed might not be a good idea, but somewhere like a couch that offers plenty of comfort is the best middle ground. Sometimes, if your brain isn't used to focusing on reading, it can get tired fairly quickly. Once your brain gets tired, trying to power through is only likely to cause you frustration. Taking breaks when you feel like your brain needs them is the best way to stay refreshed and to keep your concentration up. Occasionally, the reason behind difficulty focusing is having too many other problems to worry about. It can be hard to stop thinking about your worries and anxieties, but meditating for a few minutes before beginning to read may help you clear your mind. Knowing the best tips for how to concentrate on reading can help you have a much more productive and enjoyable reading session. For more information about trouble focusing, learn all about a lack of attention and concentration.